DETROIT, June 4, 2018 /PRNewswire/ -- Employees of Adient, the world's largest automotive seating supplier, volunteered their time to build a home for Habitat for Humanity. This year's Adient-sponsored home now belongs to Christina Van Hoose and her two children, Emmanuel, 14, and Cameron, 7. Adient has supported Habitat for Humanity for eight years and donated funds to help renovate and build houses in Washtenaw County for low-income individuals and families in the community. Each year, roughly 300 Adient employees spend months building homes for members of the community. To date, Adient has donated $247,500 toward Habitat for Humanity of Huron Valley's work and helped to renovate or build eight homes. 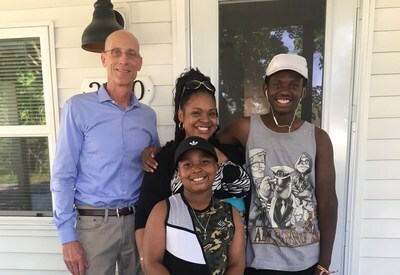 "Adient is proud to support an organization that provides families with affordable, sustainable housing," said Russ Burgei, vice president of engineering for Adient and the company's Habitat for Humanity project leader. "Our employees are always excited to volunteer for this project. It is a great way for us to give back to the communities in which we live and work." Van Hoose, who works as an internal account specialist for a gas company, is preparing to pursue a doctoral degree in Christian Family and Marriage Counseling. Her sons are dedicated to their studies, passionate about sports and involved in the Mentor 2 Youth, a program in Ypsilanti, Mich. designed to ensure youth have a promising future. Van Hoose completed her 250 hours of sweat equity, allowing her to close on her 1,100-square-foot home this week. "A special thank you to the Adient team. Your generous contributions have helped make our vision a reality and for that, we are sincerely appreciative," said Van Hoose. "We are so grateful for Adient's continued financial and volunteer support. You have helped us provide families with strength, stability and self-reliance through shelter," said Sarah Stanton, executive director of Habitat for Humanity of Huron Valley.